Whatever happened to the guy who used to sit in the corner and would always hit on my wife while I was in the bathroom? Sorry kids, but a customer died this week, and because of his bar tab there won’t be any Christmas this year. Every day I regret not telling Paul how much he meant to me…because then he might have left me something in his will. Didn’t anyone read the book club selection this month? Didn’t we used to have a guy who actually read the book? You know, the guy we all gave dirty looks? Now I can finally marry for love! My car is getting such great gas mileage now. The police must have finally caught that guy who was siphoning gas. I just knew he’d find a way to get out of the family reunion. Now whose success am I going to resent? We’ve had the worst luck since Paul died. All our plants died within a week of his death. And all our pets within two. I was just calling to make sure you hadn’t switched to a new vending machine repairman. It seems your office used to call us at least once a week because of that guy who kept getting his arm stuck in the door. No! No! Why god? Why did you have to take Paul? Why do you always take the ones who owe me money? Now who’s going to buy all these smoking jackets? So morbid for a lovely Friday the 13th! Don’t walk under any ladders….. I stayed in bed all day, just to avoid the chance of any ladders or black cats. I wonder what Zooey Deschanel will say. I think she’ll be too upset to speak. I tweet with her regularly. I’ll ask her. I’m pretty sure it’s her. After all, her picture is on her profile page. No Paul. Tell your wife that NOW she needs to marry for money. The second marriage should always be for money. I thought everyone knew that. But she married me for my money. Unfortunately she had a very poor estimation of what constituted a lot of money. That conniving schemer Carl with probably con God into letting back for another 10 years. Where the hell did your father leave the insurance policy? Since you brought up smoking jackets, I was wondering if you have nicotine patches sewed onto the elbows to make the look even MORE distinguished? Great idea. I can give other people a nicotine hit when I jab them with my elbows. I’ve been meaning to tell you how much you mean to me. . . Your timing is perfect. I was just making out my will today. No, no. It’s ok to take the Caption Contest idea. Like he’s going to need it now?? Our dearly departed fish were named Aunt Agatha and Aunt Dahlia. I guess he wasn’t kidding about needing that kidney. Oh, no, does this mean no more caption contest? 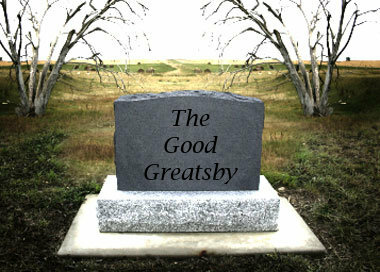 Maybe I’ll allow readers to compete to caption my headstone. I’m so glad we buried Paul in the back yard. He showed his impeccable good taste by dying young. Dying any later in life, and leaving behind a significantly aged and wrinkled corpse would have ruined the whole funeral for us. Now the ukulele’s mine. All mine! Chinese: We can finally start using correct English since that guy who paid us money to make funny signs is dead. Paul is dead. Hmm…seems I’ve heard that somewhere before. Must check my old record album covers for clues. So sorry I never had chance to meet before he went. Now we never will. The name is “God”, paul.